AgroMashov is an ideal meeting ground for people involved in various fields of commercial agriculture. This is your chance to host your clients, develop new contacts, strengthen existing ties, and increase business activities. Growers and merchants from all over the world participate and visit the show, coming with a lively interest and eagerness to be introduced to new products and services. Today, anyone who is involved in commercial agriculture understands that being a highly-qualified, proficient grower is not enough – professionals must know how to effectively market their products. Brand names can make the difference between a "losing" product and a profit-making one. The expo will showcase the secrets of branding for promoting better sales. The expo will be exhibiting new technologies, the latest research findings and the most recent service developments that can assist you in enhancing your professional skills and raise your crop yield. Among the exhibitors: labor-saving solutions based on agro-mechanical innovations; state-of-the-art irrigation systems; reduction in the use of pest control material, etc. There will be fascinating and timely meetings and conferences on the central issues of the day regard all things related to agriculture. Agromashov will hold a number of contests: flower growing, best-flavored tomato, and others. What you can achieve at Fresh AgroMashov! One of the central reasons for worldwide interest in the 25th International Agricultural Exhibition AgroMashov is the global food, water and energy shortages. AgroMashov is the most important international summit and exhibition for agricultural industry and applied R&D executives from all over the world. The 25th International Agricultural Exhibition AgroMashov provides a golden opportunity for farmers and members of the agro-business manufacture and trade community to present their products and services - from initial growth to final sale. The geographical location of the trade fair – at the juncture of three continents - Europe, Asia, and Africa - makes it an international magnet for growers to display their produce to international traders, and for buyers to create new commercial contacts. Agro-technology and machinery, irrigation and water control, pest control, fertilizers, seeds companies, importers and exporters of fresh produce, wholesalers and retailers, marketing chains, shipment and cargo companies, manufacturers of sorting, washing, labeling and packaging machinery and equipment, cooling and storage equipment, transportation and logistics. The list of some of the international brands to exhibit at “Agro-Mashov” this year includes: John Deere, Bayer, HCR Seeds, De Ruiter Seeds, Messy Ferguson Tractors, New Holland, Case, Pure Line Seeds, Kaneko Seeds, Takada Seeds, Monsanto, Zata Seeds, KEKKILA, Agresco, Carmel, Jaffo, Origin Seeds, Deshanim-Israel and many other international brands. 1 table, 2 chairs, I electrical socket (220 volts), lighting and fascia with company name in English (without logo). 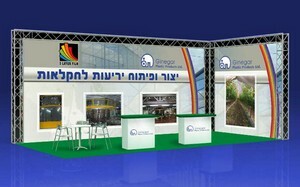 The booth is enclosed on three sides. 1 designed table, 3 chairs, 1 electrical socket (220 volts), lighting, carpet. 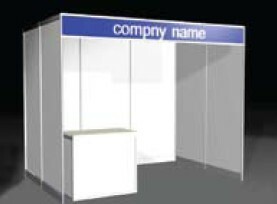 The name of the company and logo will be added to the designed upgraded booth, printed and attached to the walls.